Cinderella. . . a story that has been immortalized in opera, ballet, fairy tales, film, and finally, exquisite porcelain. One of the most charming moments in filmmaking comes to life in this scene of enchantment and beauty. The Fairy Godmother beckons Cinderella to step into the elegant Coach. In place of her rags, Cinderella wears a beautiful ball gown, a rat has been transformed into a coachman, and two mice into gallant white steeds! Richly decorated, the magic of this special moment is now yours to enjoy forever. 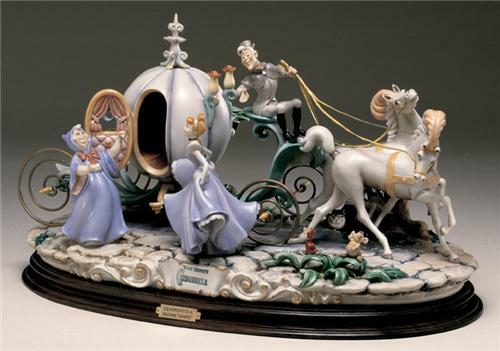 This exquisite porcelain Capodimonte sculpture is from the Disney Laurenz Classic Collection. It is a limited edition of 439 pieces total made world wide. This is the Rolls Royce of Porcelains. This was created by Enzo Arzenton. He is an Italian sculptor who suddenly took ill and closed his shop in Italy. He did all the molds, fired all the pieces, and hand painted all the pieces to his perfection. This is truly a work of art.